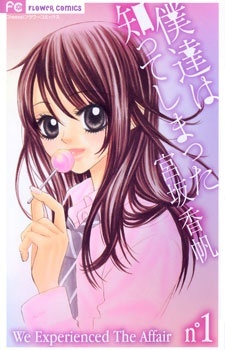 A typical shoujo manga with a cutesy girl. But I must say I like this one a bit more than most, it has great humor and the main charater doens't cry about every thing. And with her I get the feeling she at least tries to do something when there is drama, she doens't just run away crying. I randomly pick this manga cos I'm bored.. It's your typical shoujo manga,quite cliché.. Quite predictable plot too.. BUT I have to say I enjoy reading it because of the lil comedy in it..atleast it makes me laugh a bit.. & I find it unique that they didnt put your typical "childhood friend".. The heroine totally has no friend.. So I'm glad that they show how she progress with both love & friendship. Overall i gave this manga a 10, because I truly enjoyed it! Even after having read tons of shoujo manga, I found this to be very refreshing due to the humor contained within it and the realistically imperfect characters. The story is relatively predictable, but that doesn't mean in any way that it is boring. The situations that the main and side characters are faced with become even more interesting through the reactions of the characters and how they deal with the issues that confront them. Moreover, the characters are very loveable and reader will become easily attached to them. What I love the most about the main character is how awkward she is about love since she has never experienced this before, as well as how by using her character the author is able to realistically express how hurtful loneliness can be. The art style is very typical shoujo, so of course basically all female characters have huge eyes, which I find slightly irritating at times. However, I believe that the way expressions of characters have been drawn and how the main character is seen to react in situations, completely makes-up for this. As stated previously I enjoyed the manga, and this is especially due to the humorous yet realistic expression of emotion, worries, awkwardness and a whole lot more which you will have to read the manga to find out!